In Ninawa province in northern Iraq, a conventional distinction is drawn between the Hashd Sha'abi and the 'tribal Hashd'. In general, the former comprises more familiar Hashd formations with registered brigade numbers on the Hashd Sha'abi Commission, while the latter consists of smaller groups defined by regiment numbers. However, it should be noted that most 'tribal Hashd' formations have a connection with the Hashd Sha'abi Commission. 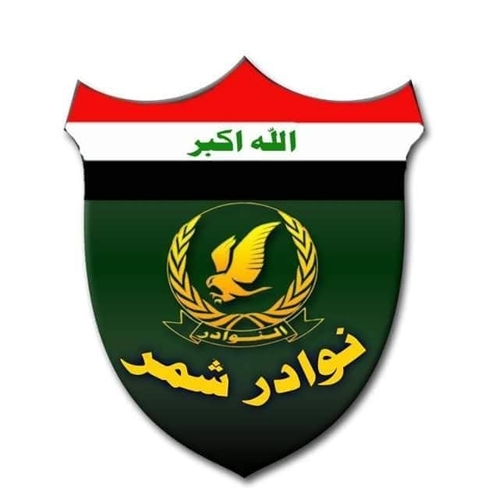 Yesterday, I conducted an interview with a member of the Nawader Shammar formation, which is affiliated with Ninawa MP Abd al-Raheem al-Shammary and is the 91st brigade on the Hashd Sha'abi Commission. The commander of Nawader Shammar is led by Abd al-Khaliq al-Mutlak al-Jarba, the brother of Abd al-Raheem al-Shammary. In one way, the Nawader Shammar formation shows that the concepts of Hashd Sha'abi and 'tribal Hashd' can overlap, since the group comprises more than one regiment within the constellation of 'tribal Hashd' regiments in Ninawa. The member of the Nawader Shammar formation whom I interviewed is specifically of the 69th regiment of the formation (the other main grouping within the formation is the 70th regiment). His name is Jamil Mashi Shatti al-Shammary. Nawader Shammar was the first to raise the Iraqi flag in Mujamma' Umm al-Dhayban and Mujamma' Umm Jaris on 26 March 2016: Jamil participated in this operation that was supervised by al-Muqaddam Jabbar Abu al-Harith from the Amn Watani. Q: When was the brigade formed? A: At the time it was formed, all of the provinces [i.e. Salah al-Din and Ninawa] were in the hands of Da'esh [Islamic State], except Tikrit and liberated Baiji: 28 February 2016. Q: In which battles has it participated? And many of the villages. Q: From which areas are most of the members? A: Salah al-Din and Ninawa, from the sons of the Shammar tribe. Q: How many martyrs has the brigade offered in defending our homeland? A: 15 martyrs and 7 wounded . From among the martyrs, 14 martyrs from one squadron: the second squadron of the 69th regiment. In the battle of the al-'Aliya village, it gave 11 martyrs, one wounded and two unharmed. And in the Mujamma' Umm al-Dhayban it gave three martyrs. These are from the second squadron. And there is one martyr from the HQ squadron. The 1st regiment, I believe 5 martyrs and wounded. I do not know. Q: Why has the brigade become the 69th regiment now? A: Look, I do not know. We have the 70th regiment and the 69th regiment, and there was the 1st regiment, and now the 1st regiment has joined the 69th regiment. And now in the brigade there are just the 69th regiment and the 70th regiment. So on the contrary, yes, it is still the 91st brigade, but when I introduce myself, I say the 69th regiment. Q: Are you still receiving salaries from the Hashd Sha'abi Commission? A: Yes, from 2016 until now we have been receiving. Q: In which areas does the brigade operate currently? A: In the al-Ba'aj district and the villages affiliated with it, and still holding on its own a line from the direction of Jazeerat al-Ba'aj. Q: How do you assess the situation in Ninawa currently? A: In the al-Ba'aj district, excellent. Within the sector of our responsibility and the responsibility of the heroes of Liwa Wa'ad Allah the 33rd brigade, excellent. And the rest of the province, the situation is very good.